This post contains spoilers for Daredevil #14, so read the issue first! And you should, it was great! My first reaction to this comment was “Wow, some people sure do seem to like reading the science posts as much as I like writing them,” followed by “Hm, I never did get to that post on proprioception, did I?” I was going to just let it wait until I start working on the Daredevil Science ebook I’ve been planning to write over the summer, but a particular panel from last week’s Daredevil #14 gave me the reason I needed to get to it right away. So, what’s so special about this panel? Well as anyone who has read Daredevil #14 will know, Matt was infected with a very nasty strain of Latverian nanobots, programmed to completely take away his senses, and he ends the issue in a state of being more or less outpowered by Helen Keller (who, incidentally, was born exactly 122 years ago today). In the panel above, we see Matt make a comment about losing his sense of touch, something he had also alluded to a few pages earlier. This panel is also a good reminder of the fact that while we often think of touch as being the tactile recognition of the outside world, we are also dependent on a form of “inner touch” to give us a sense of our general position and where the parts of our body are, relative each other. In this case, it is clear that our intrepid hero doesn’t feel the horse’s body pressing against his legs, nor does he have the sensation of his legs moving. While I won’t go into the sense of balance specifically (that will have to wait until the ebook), the vestibular system of the inner ear is a part of proprioception in a broader sense since it gives us information on how we are positioned relative to the planet we live on, as well as things like rotation, and acceleration. Our sense of our movement, however, comes from nerve receptors in the muscles, tendons and joints. These are the muscle spindle, the Golgi tendon organ, and the Pascinian corpuscle. The latter is also present in the skin and in various internal organs. The muscle spindle is embedded in the muscle fiber and detects the length of the muscle. It’s also responsible for the stretch reflex. Golgi tendon organs are found in tendons, where the muscle attaches to the bone and senses muscle tension. What happens when proprioception is lost? It’s a well known phenomenon that spinal cord injuries lead to (varying degrees of) paralysis and loss of sensation below the level of injury. For this reason, it may seem natural to see motor function and touch sensation (including proprioception) as inextricably linked. However, there are scenarios in which a person may be unable to move, but have spared sensation (as is seen in people with ALS), or have normal motor function but lack normal sensation. Yes, cases such as Daredevil’s current predicament have been recorded, though it’s safe to say that nanobots have never previously been implicated in the process. With or without nanobots, extreme cases of loss of touch and proprioception are exceedingly rare. One well-documented case, however, is that of Ian Waterman who, after contracting a virus as a young adult, found himself suddenly “without a body.” In order to move about and interact with the world he uses his vision and an enormous amount of concentration to monitor all of his movements. I’ve said many times that I find Daredevil to be a very believable superhero, despite his lack of natural vision. One of my main arguments for this is that if we are to believe that his other senses are dramatically heightened, then that would include such things as his senses of balance and proprioception. His athleticism may be mostly practice and hard work, but having an unusually good body awareness would certainly help. It’s rare that I learn a new word. And yay, another science post! Thanks for this! I actually tried to test this out. I work at a horse stable so when I was out schooling one of the horses I tried to respond purely on sight for part of my ride. Since I can’t exactly turn my sense of body off, I didn’t get a very good understanding other then a few things. With a horse that was well trained and on level/good terrain at flat work (just walk/trot/canter/gallop) there wouldn’t be that much of a problem since a lot of it can be supplemented with what you see and a proper seat (hence how paraplegic riding is possible). But riding xcountry like DD was would have been terrifying. It is considered one of the most dangerous sports in the world – with it’s high injury and mortality rate – and he was riding it handicapped to one of the main assets you need when riding. One of the biggest things on riding is your seat in the saddle and the position of your legs which takes years to learn so it’s natural and so you know how to adjust to the situation and the balance. With the lack of self awareness, half of that would be taken out because you can not feel what the horse is doing. Horses are just as likely to stumble, to try and jump something that you didn’t think that they would on a trail, or to take a jump poorly. Any of these are easy enough to jerk you out of the saddle if you are not able to correct your balance right when it happens. Going up and down hills alone changes your center of balance on the horse. All this is just hoping the horse is being perfectly cooperative as well. It was one of those times where I wish I had even a partial practical understanding of DD’s radar sense to see how much it really would have helped. With his radar, he was able to tell his body’s position and that of the horses, but would that have given him enough information and fast enough that he would be able to adjust to it with out being dumped? “I don’t get it! 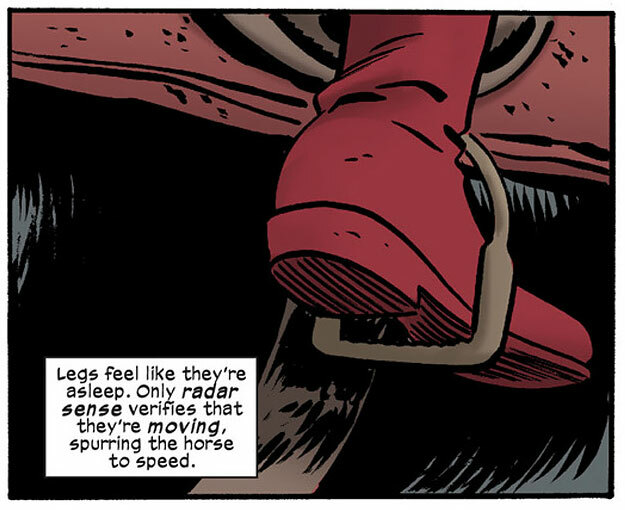 Ever since my accident I seem to do everything lots better than before … even without my sight!” Matt from Daredevil #1. If he could read this post, he would understand. They really should do more to explain this aspect of DD’s powers in the text. It would go a long way to help passive Daredevil followers understand why he can do some of the things he can do.